As simple as it may sound to sew on a button, it can be intimidating at first. When you actually get everything ready, you might be wondering how to start. Do I enter the fabric from the top or the bottom? Do I double my thread or tie a knot? Let’s explore these questions so that your buttons will stay put for the entire life of your garment. Buttons come in many different shapes, sizes, and materials. You’ll usually be working with either a flat button or a shank button. Flat buttons have either two or four holes and shank buttons do not have holes but rather a shank on the back side. Let’s learn how to sew on both types. Here’s what you’re going to need to sew on a button on by hand. First, you’ll mark your fabric where you want your button to be. If you’re working with a pattern, your button placement should be indicated on your pattern piece. If you’re not working with a pattern you can measure where you want your button to be with a fabric pen and a seam guide. Choose a needle that will go through your fabric easily. Bulky fabrics will require a heavier duty needle. To thread your needle cut about 20”-36” of an all purpose cotton thread. You can also use a heavy duty thread if your fabric is bulky. Thread your needle and pull your thread through so the ends are the same length and your thread is doubled up. Insert your needle from the wrong side of your fabric up to the right side. There’s no need for any bulky knots, just pull your thread through till there’s about a 1” tail left. Place a finger on your tail so it doesn’t pull through as you make your first stitches. Make three very small stitches by passing your needle from the front side to the back three times. These tiny stitches are called lock stitches and the will ensure that your thread ends never come out. Starting from the back side of your fabric, bring your needle to the front and go through the first hole of your button. Then go back down through the hole on the opposite side and to the back side of your fabric again. You’ll want to have some wiggle room for the next step so we’re simply going to place a needle underneath that first thread on the top side of your button. If you’re working with a really thick heavy fabric, you’ll want more room so you can use a toothpick instead of a needle. This trick will keep your button from sitting directly on your fabric and will leave some space underneath it for the thickness of your buttonhole. Pass the thread around the same way two more times with your spacer still intact. If you have a 4 hole button repeat this step with the other set of holes. You’ll now create some space between your button and your fabric as if your button had a shank. Starting from the back side, bring your needle to the front in-between the fabric and the button. Now wrap your thread around the underside your button. Wrap it around three times and then take your needle to the backside of your fabric again. Finish it off the same way you started by taking three small stitches to lock your thread. Then I like to pass my needle underneath all of my stitches and I cut my ends off. And voila, you have a beautifully sewn on a button that’s not going anywhere! Sewing on a shank button is very similar except that there are no holes to go through and you don’t need to create a shank with your thread since it already has a shank. You can also do step three if your fabric is light weight but for really heavy wool coats and such I like the added comfort of having a knot. After you have doubled your thread make a knot with the two ends. Then insert your needle from the top side of your fabric so that your knot will be hidden underneath your button. You can also make a few lock stitches if you desire as well. Threading your button will be a bit different since you have no holes in a shank button. When you bring your needle up to the top of the fabric, pass your needle through your shank and then take your needle to the backside. When you come up to the front again, pass your needle through your shank two times to wrap it once around your shank. Then take your needle to the back side again. Repeat this two more times for a total of three times. You can finish this a few different ways. You can take a few tiny stitches from the back side and then pass your needle under your thread like we did above. Or you can tie a knot on the back side of your fabric or underneath your button. I personally don’t like the way a knot looks on the back side so if you do choose to do another knot you can try and squeeze one in under your button which may or may not be easy depending on the size of your button. The button will hide your knot and then you can cut your threads. I like my stitches on the backside to look just as nice as the top side. When I take my needle to the back I make sure I’m inserting the needle in a place that will give my threads a uniform appearance. Traditionally it’s better to choose a thread color that matches your fabric rather than your button. I chose the green above just so it was easy for you to see what I was doing. So do as I say not as I do! You can use the same color of thread as your topstitching if you have any on your garment or you certainly can use a contrasting thread. Use a two hole button for light to medium weight fabric and a four hole button for medium to heavy weight fabric. Shank buttons are great for really bulky fabrics but they can also be used on garments with flow and drape. The shank button I used above is from a silk blouse. You’ll want to choose one that’s appropriate for your garment. And that’s all there is to it. 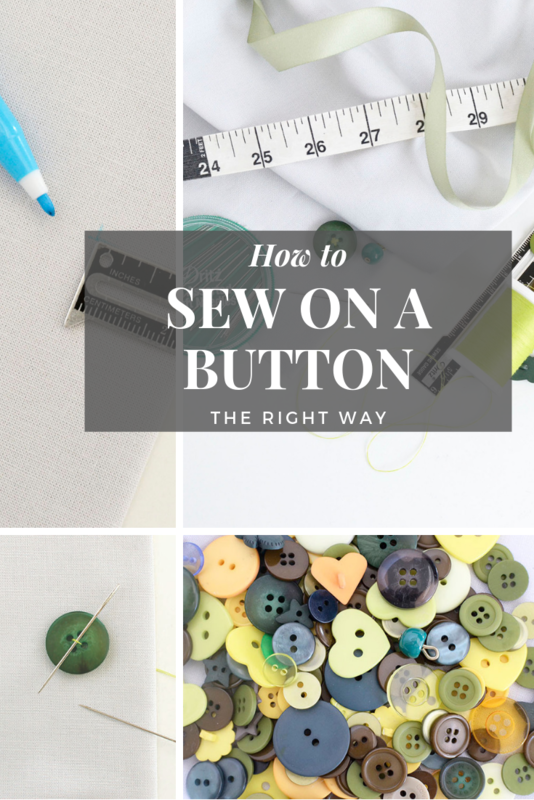 Now you know how to sew on a button the right way so that it never falls off!